Adaptabar - the simple way to secure your windows without the expense and delay of having window bars "Made-to-Measure"
You`ve secured your doors with an insurance approved lock, fitted window locks to all your windows ...then some nice person breaks the glass and climbs in through one of your rear windows! Even if you have a burglar alarm, you`ll be surprised at just how quickly a burglar can be in and out - even with alarm bells ringing. 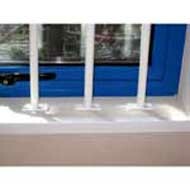 It`s then, after a break-in, that most people decide to fit window bars - sometimes called burglar bars, which is crazy! ...why not fit window security bars first and avoid the pain of discovering all your valuable possessions missing? So what do you need to know about window bars? With Made-to-Measure window bars, your measurements need to be dead accurate (and must allow for variations in height across the width of the window as very few windows are square or true) - to the millimetre, otherwise they won`t fit when they arrive! If they`re too small, they`ll rattle around and won`t be secure, and if they`re too big, you`ll never get them to fit in the first place. Not so with Adaptabar - you just need to do a rough measurement and then choose one of the telescopic bars with a size range that covers your rough measurement (stock sizes available for windows up to 1700mm (67") in height), and because they`re adjustable, Adaptabar window bars will fit every time. With made-to-measure window bars, the only way to guarantee they`ll fit is to have someone come out and measure up for you. The trouble is - this means having a sales person visit and who needs that! Plus, they`ll cost you more, because one way or another, you`ll pay for the sales visit! 4 provides the same high level of security as made-to-measure bars. Plus... the other advantage of Adaptabar is, they`re a piece of cake to install. In fact anyone can install them with nothing more thanbasic DIY skills. If you totally screw up your measurements by a country mile and your Adaptabars don`t fit when they arrive, you can return them for a refund, or replacement size. With Made-to-measure, you don`t have the peace of mind of knowing that you can get your money back if you don`t like them, they don`t look right, or they don`t fit your windows properly. It`s because they`re Made-to-Measure and not resalable to anyone else! If you are not completely delighted with your Adaptabar system when it arrives, simply return it for a full refund of the purchase price paid. We have a no quibble policy because total customer satisfaction is our No. 1 Priority. 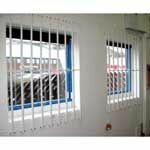 Adaptabar Security Window Bars - a quality professional security product. Adaptabar window bars are professionally engineered steel bars for commercial and domestic security applications - please don`t confuse this professional security device with `fly by night` grade gimmicks! Each bar is finished in a durable commercial grade brilliant white paint finish, which easily blends with modern decor at home, in the office, club, pub or restaurant. In most cases, the bars alone will give you the security you need, but for maximum security, or where the bars are longer than 1372mm (54") you can easily convert the bars into a security grille by adding the optional lateral spacer bars. In addition to business and home use, Adaptabars are also widely used in the school, sports pavilion, pubs and shops. in fact, any place where you need to keep intruders out. How many Window Security Bars do you need, and what type? - a piece of cake to fit ...and actually costs you less. ... Plus it`s just as secure as any Made-to-Measure window bar system! Don`t worry - we`ll sort it out! What do you need to protect your windows?